A substantial development site in Connah’s Quay in Flintshire is the pick of the commercial lots in SDL Auctions Cheshire and North Wales next auction at Chester Racecourse on Wednesday 25 April. The plot at 231-235 High Street in Connah’s Quay, comprises three former commercial buildings with outline planning permission for demolition and redevelopment. 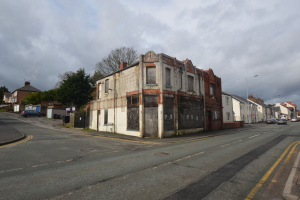 The plans currently permit the construction of three ground floor commercial units, which have potential for development subject to gaining planning permission, along with six residential flats above. It has a *guide price of £75,000-£100,000. Also included in the catalogue of 25 lots is a commercial investment opportunity at 51 Hungerford Road in Crewe, a ground floor premises currently let to Martin McColl Ltd, expiring in September 2020 and currently producing £10,250 per annum. The property is located on a main arterial route, close to the town centre, and has a guide price of £95,000+. Another retail property at 11 Chester Road in Shotton, Deeside in Flintshire, is a three storey, mid-terrace property located on the main pedestrian high street and is situated between a Boots pharmacy and a NatWest bank. It has a guide price of £50,000-£60,000.